This lovely little sprite from AuroraWings caught my attention when I was at their store choosing images from my win in last month's challenge. :-D She's called Wild Rose Sprite but I colored her in peachy gold colors to look like the rambling roses my mom cultivated along the back porch arbor when I was growing up. That's my absolute favorite color for roses to this day! 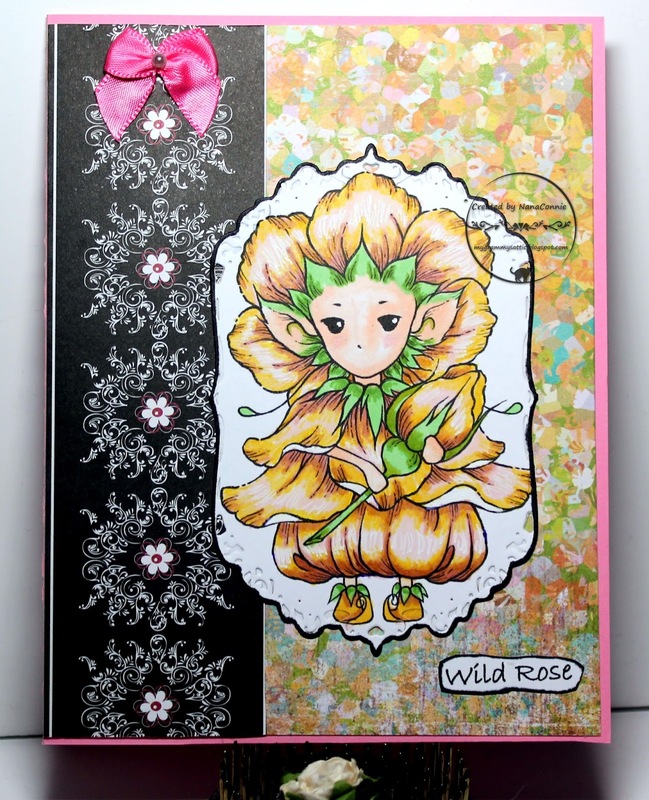 I colored with ProMarkers, then die cut the image with one of my Spellbinders dies. I inked the edges with black ProMarker. I started digging through my scrap basket and found that beautiful paper which mirrored the colors I had used in the image. What is odd about it is that I simply don't remember ever having seen that paper before! It was the only scrap like it and I did a quick look-through of my paper stacks but nothing like it exists in my stash. Hmmm, oh well, call it a lucky find or a miracle, I love how it "made" this card ! The black strip is fabric ribbon that came in a card kit but I didn't use it for either of those projects so it was waiting for me when I wanted something out of the ordinary for this one. I printed and hand cut the sentiment, then sewed together the tiny, pink bow with the pearl. It looks bright pink in the photo but is actually a perfect match for the pink card base, visible around the edges of the card. Love this pretty card with such a sweet image on it. Your coloring is fabulous and isn't it wonderful to bring back those memories. 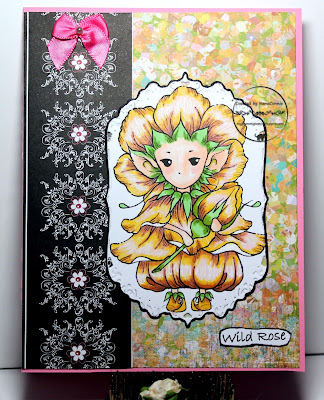 Gosh Connie, what a beautiful card, love the colouring of the rose sprite. Adorable card and cute image wonderfully colored. I love it. Awww! The little Ramblin Rose is just so dainty and so pretty in the yellows. That's such a pretty die (that Spellbinders Gold Labels 4)I love how those design elements are picked up in the side panel. Gorgeous Card, wonderful colors! Thank you for joining us for the Aurora Wings Sprite Delight V--and 4th Anniversary Celebration. ~Priss Steelman~ Aurora Wings Guest Designer for March. Such a pretty card. So glad you could join us for Viva la Verve! WOW Connie, this is stunning! The colouring is fabulous and loving the colours you chose too. This is a fabulous colour indeed! I do love the more delicately coloured rambling roses - I had a lovely white one with peach tones to the base of the petals, groing through the hedge at my last house. Beautiful coloring! Thanks so much for playing in our Fussy and Fancy Challenge! Please come back again soon! I am so impressed with your colouring, wow! Great card Connie, love it!